Robeks announced that it donated $6,133.34 to Wyclef Jean’s Yele Haiti Foundation in an effort to continue support following January’s devastating earthquake. The funds were raised during a spring “Hearts for Haiti” initiative tying the relief effort to Robeks’ limited, one-time offer of its Chocolate Covered Strawberry Smoothie. 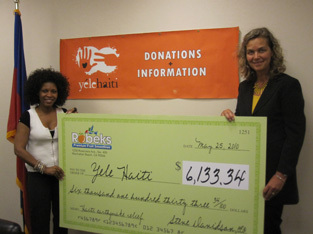 The donation was recently made by Robeks regional director Katrina Bickford to Lexy Brooks, event coordinator for the Yele Haiti Relief, at the Foundation’s Manhattan office. California-based Robeks is a leading national chain of premium made-to-order fruit smoothie restaurants. As part of a seasonal promotion associated with Valentine’s Day, Robeks introduced a Chocolate Covered Strawberry Smoothie and announced that a portion of those sales would go toward Yele’s Haiti relief project. Another motivating factor was that one of Robeks franchise owners, Martine Cadet, in New Rochelle, New York, had relatives affected by the quake. Fortunately, all members of Cadet’s family are safe.